The PE9354 SPDT switch is designed to cover a broad range of applications from 1 to 3000 MHz. This single-supply reflective switch integrates on-board CMOS control logic driven by a simple, single-pin CMOS and TTL compatible control input. Using a nominal 3V power supply, a typical input P1dB compression point of +31 dBm can be achieved. 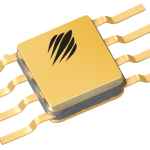 The PE9354 also exhibits input-output isolation of better than 30 dB at 2.0 GHz and is offered in a small 8-lead CFP and as DIE.